Browse our easy to follow guides and tutorials that demonstrate how to use WHMCS and resolve common problems. 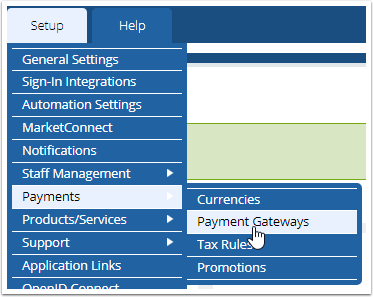 A crucial step to setting up every instance of WHMCS is ensuring you have a Payment Gateway configured. Let's get started. WHMCS is compatible with several dozen gateways out of the box. A complete list of the supported gateways can be found here. Once on the Payment Gateways page, choose All Payment Gateways to view the full list. On the page listing all of the available Payment Gateways, choose the desired gateway. For this example, we will be choosing the Stripe Tokenized Gateway. Upon choosing your desired gateway, you will be presented with the configuration form for the gateway. In our case, we will input the data retrieved from the Stripe console, however each gateway will ask for different information. For a full description of what each gateway will require to complete configuration, please reference the Supported Gateways list. Upon pressing Save Changes, your WHMCS is now ready to accept payments! Simply repeat this process for each additional gateway you wish to configure. WHMCS does not limit how many or how few gateways you can configure on your system. Copyright © 2017 WHMCS Limited. All rights reserved.